Remember when Adam Brody, then best known as a teen heartthrob on the TV series "The O.C. ", turned up in a small role in 2005's "Thank You for Smoking" and showed real comedic chops as a fatuous Hollywood player's fatuous assistant? That was kind of fun. Kid showed promise, as they say. Hasn't really panned out, alas. 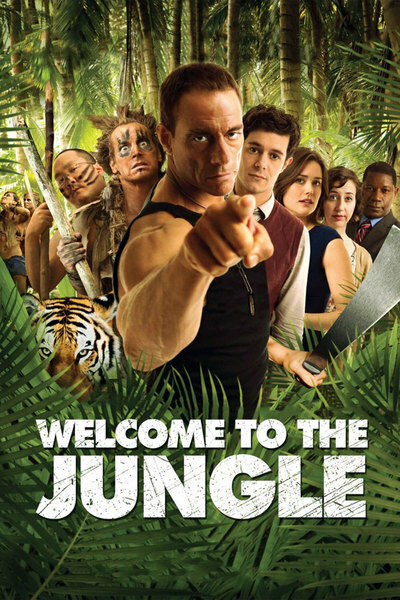 Today sees the limited theatrical and Video On Demand release of "Welcome To The Jungle," a motion picture comedy whose end credits bear a copyright date of 2012—not a good sign for a 2014 release. While the movie's promo materials push it hard as a comedic debut for not-entirely-career-resurrected action star Jean-Claude Van Damme, the movie's real lead is Brody, who plays a bright but not sufficiently aggressive junior staffer at an ad agency. The movie begins with a tepid "Rushmore"-daydream lift, shifts into quasi-"Jerry Maguire" gear when Rob Huebel's agency rival character blatantly steals an account-winning idea from Brody, and then goes almost full aspirant gonzo when the ad agency's honcho, a relaxed Dennis Haysbert, announces a corporate retreat to be headed by vainglorious paramilitary motivational dude played (with not much besides a neutral lugubriousness) by Van Damme. Van Damme's character, who's marked as something of a fraud from the get-go, flies the motley yuppies to a tropical island, where things go highly awry pretty quickly. Internecine squabbles, with Brody's capable but still not-assertive-enough Eagle-Scout skills on one side, and Huebel's crazed quasi-anarchic "Lord of the Flies" vibing on another (aided in the latter's case by hallucinogens in a thermos of ersatz coffee that compel a lot of the clerical pool to "go native," inasmuch as that idea might apply), ensue. Soon enough "Welcome to the Jungle" morphs into something like an "Apocalypse Now" parody. Which, to give writer Jeff Kaufman and director Rob Meltzer some credit, is a least a timely joke. Oh wait. The presence of Huebel and misfit-schtick-mistress Kristen Schaal contribute to a "Best Week Ever" snark-absurdism aspiration, and it's hard to tell whether the failure of this movie is attributable to the fact that stretching that kind of humor into a feature-length film just inherently doesn't work, or if it's just that the jokes themselves aren't that funny. I believe, personally, that it's the latter, but I can't be entirely sure. On the other hand, don't want you to have to spend seven dollars to make sure, so maybe you should take my word for it. Commendably keeping her cool throughout is Megan Boone, pre-"The Blacklist" and hence pre- that awful wig they make her wear on the show; future accounts of the actress, who bids fair to becoming the almost-thinking-man's Cobie Smulders, will note well her professional sangfroid here. As for poor Brody, the comic skills he once summoned up here seem subsumed by a befuddled indifference; he spends most of the movie doing not much else than looking miserable. I cannot say that I blame him.